Portable Bluetooth speakers are on the rise right now. 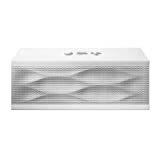 No other type of audio system is growing in popularity as fast as Bluetooth speakers. If you want to buy such a device, but you are limited to a budget that is lower than 200 dollars, there is no need to worry. You can find many great devices for this budget. Between 100 and 200 dollars, you can find premium speakers with a high-quality audio output and high portability that can be better even than more expensive systems. 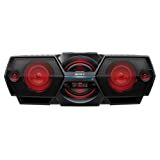 How to Choose the Best Bluetooth Speakers Under 200? This speaker is priced just a bit lower than 200 dollars, it is not very small but not too large either (longer than a 4-inch screen smartphone). The device has three different buttons on it (shaped like this: round, minus and plus) and three ports on the side: a microUSB port that is used only for charging, a switch that you can use to turn the device on and a line-in port that can be helpful if you don’t want to use the device as a Bluetooth speaker. The Lithium-Ion battery ensures about ten hours of continuous play and the battery life is displayed on the smartphone you are using the device with. Sony ZSBTG900 is a Bluetooth boombox that looks incredible due to its futuristic design. It is black, with red lights on the speakers and a straight blue line under the Sony logo. The lights on the speakers provide a cool effect. These lights can change their intensity according to how you set up the woofer, or according to the rhythm of the music. You can connect this boombox with devices such as laptops, tablets, or smartphones. For volume adjustment, there is a volume control at the top that looks like a spinning dial. The total output of this system is 20 W, with two channels and bass. Creative is already known for its amazing products in the computer industry, such as speakers and sound cards. 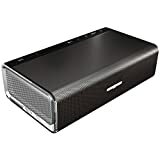 Sound Blaster Roar is a piece of technology that maintains the quality that is usually provided by Creative, delivering a huge amount of power for a price that doesn’t exceed 200 and a small enough size to make it highly portable. The high performance is ensured by five different drivers that are powered by two individual sets of amplifiers. Creative Sound Blaster Roar also has a subwoofer for bass amplification and for offering an enhanced audio mode. It uses AAC and aptX for Bluetooth audio and NFC technology.